One of the more interesting cases among the seventeenth century Leicester archdeaconry court proceedings refers to a scandalous and defamatory exchange alleged to have taken place in an Appleby alehouse. The incident is reminiscent of an earlier case involving Appleby inhabitants which took place four decades earlier at another alehouse in Atherstone. We know Appleby had at least one alehouse in Tudor times - perhaps the sixteenth century timber-framed ‘Black Horse’ described by Gerald Box - since as far back as 1579 a certain Richard Warehorne was granted a licence to keep one here. Richard may well have been the son or kinsman of Roger Waren whose will and inventory from 1553 survives among the Appleby probate records. This archdeaconry court case confirms that there was an alehouse here in 1640, possibly the same one, kept by a certain John Pratt whose surname appears frequently in Appleby records around this time. One Tuesday afternoon “between 3 and 4 o'clock … a little before Whitsontide” in the summer of 1640 a small group of locals gathered in this village tavern or drinking den. They comprised Richard Walker, a yeoman farmer who may by then have been living at Walkers Hall in the main street, his wife Mary, another farmer, John Mould and his wife Susan, Thomas Sherwood, Robert Heaward, the village blacksmith, and William Foster, described as a tailor. Sometime during the afternoon, as tongues perhaps loosened under the influence of the local ale, the party began to quarrel. An acrimonious exchange of insults led eventually to a defamation case being heard in the Leicester archdeaconry court, the ecclesiastical authority which handled disputes of this sort. According to Sherwood, who was one of the witnesses called to give evidence, they had gathered "in the house of John Pratt who keepeth an alehouse in Appleby ", a regular meeting place judging from this account. On the day of the incident, "upon what occasion [he] remembreth not “, Mould's wife and Walker's wife “told one another that they were whores and suchlike terms”. Mary Walker told Susan Mould “that she was Paul Ayer's whore whereupon the said Richard Walker … said unto Susan thou are Paul Ayer's whore." There is no direct reference to Paul Ayer in the parish records, however a Tudor family with a the family name of Heyre was connected to the labouring poor in Austrey, and a servant with this surname left a will which was registered among the Appleby probate records. There is no doubt that Susan recognised the name of her alleged partner. In fact she treated it as a serious slur on her reputation - an insult which could not be left unchallenged in puritan times. When Susan asked Richard to withdraw this cruel accusation "Richard answered that if she were not Paul Ayers' whore … then she was John Gillam's whore and he would prove her so", a comment that only inflamed the situation. Again, there is no trace of anyone called John Gillam in local records though doubtless he was known among the company for the argument grew more and more heated until, as William Foster recounts, Susan Mould and Mary Walker "fell to miscalling one another in very violent and scandalous terms and did fall to cuffs together". In giving his evidence of the events that took place John Mould told the court that Richard and Susan's son David was "born within six months ... after... their marriage" - an obvious inference that David was conceived out of wedlock. Entries in the Appleby parish register confirm the likely truth of this observation. While nowadays such a charge would hardly arouse much concern or approbation it was obviously meant to impugn the Walkers’ reputation. 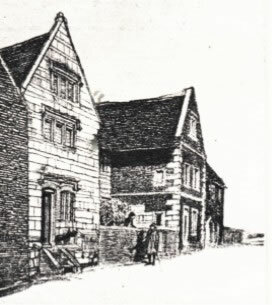 In their defence John Pratt, the landlord of the alehouse, testified before the court that the Walkers were of good repute amongst their neighbours in the village. He suggested by way of explanation that Richard was "taking his wife's part" and argued that Richard had been provoked, being called "Goodman Handland and some other scandalous words" – the exact meaning of such a curious title being somewhat obscure. Whatever the exact cause or justification for the insults, Susan nevertheless felt herself "defamed and scandalised”. We are told that “she had languished and been much discontented and seldom or never cometh abroad whither to Church or anywhere out of her own house". This charge is more serious when it is considered that Susan was a regular churchgoer and wife of a prominent yeoman in the village. Unfortunately we do not know the final outcome of the case. Judging from other cases and the continuation of village life without further litigation between the participants, it seems likely that the parties were reconciled and peace restored to the parish. This case is interesting because it provided a glimpse of the rowdy and somewhat disreputable atmosphere of the seventeenth-century village alehouse. Even in quiet agricultural parishes the villagers got drunk, argued and if we are to believe the witnesses, goodwives might even “fall to cuffs together”. The fact that the dispute was regarded as serious enough to be taken to court, highlights just how jealous the villagers were of their reputation and good name. W.H. Hart, “List of the Alehouses, Innes, and Taverns in Derbyshire in the year 1577”, Derbyshire Archaeological Journal, I (1879), 68-88. L.R.O. Archdeaconry court proceedings: Walker & Walker v Mould, 1D41/4/XXVI/46-9.